Uri, November 07 (Scoop News)-Jammu & Kashmir National Conference President Dr. Farooq Abdullah on Sunday impressed on the governments of India and Pakistan to start a sustained dialogue process and advocated an Ireland type settlement model to resolve the procrastinated J&K issue. 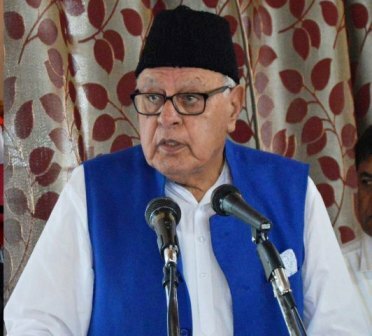 Dr Farooq Abdullah while addressing a public gathering at Uri said that a day will come when the people of Jammu and Kashmir will breathe in a peaceful atmosphere shorn of any insecurity. “We shouldn’t feel disheartened. The current situation is grave but we have witnessed even worst throughout the history. At one time in our history, people would not buy the idea that the autocratic rule will end. But a day came when democratic forces usurped the Kings’s throne with determination and struggle,” he said. Recounting the contribution of Sher e Kashmir and Madre Maharban, he said they worked tireless for the socio-political emancipation of the people of the state. “My parents drew their energy from the teaching of holy prophet of Islam. It was the very essence of Prophet’s teachings that kept them going notwithstanding persecution, confinements and political retribution,” he said. Dr Farooq said that the state’s special status was infringed upon by the machinations of national political parties including Congress and BJP and that their attitude hasn’t changed. “The current situation is no different. People should remain watchful of crafty politicians who are product of these machinations. Self respect and dignity of our state should not be bartered for few pennies,” he said. Later Dr. Farooq Abdullah visited the family of Ex MLC Late Muhammad Aslam Banday and offered condolences with his family. He was accompanied by senior party leaders including MLA Muhammad Shafi Uri, Javaid Ahmad Dar, Advocate Shahid Ali, Neloofar Masood, Muhammad Yaqoob Wani, Dr Sajjad Uri and other party functionaries.